Then She Found Me is a lemon tart of a film; sweet, tart, small (90-ish mins). It breaks a lot of rom com conventions by following slightly older people with slightly older problems: biological clocks, baggage, ingrained imperfections. And, because of that, it feels refreshingly honest and it's unexpectedly touching. Honestly, this film really hit us right here. It had a romance that moved us in ways that movie romances haven't moved us in a long, PPCC-saturated time. Oh, you people. April (Helen Hunt; appropriately named for themes of love and fertility) is a kinda high-strung, kinda devout, kinda nice elementary school teacher in New York City. She's "39 and a half", and feeling the strain of her biological clock. She desperately wants a baby, and has been trying for months. Things go sour (lemon tart!) 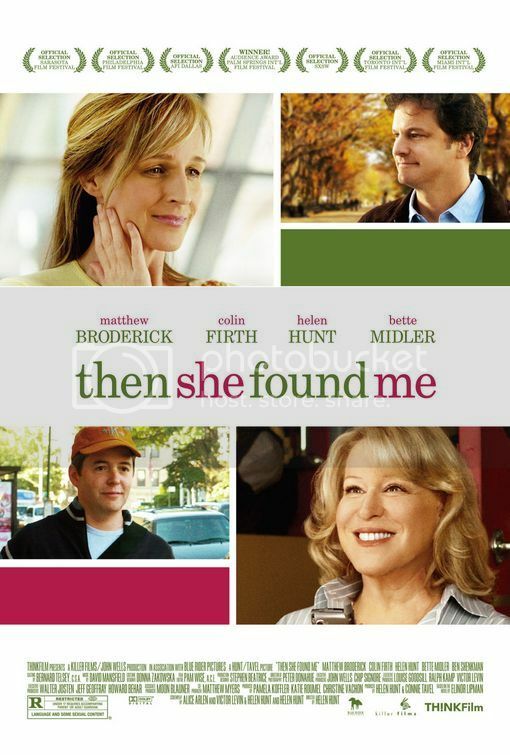 when her husband, Ben (Matthew Broderick), decides he doesn't "want this life" and walks out (taking the dog!). Things pick up a bit when she meets Mr. Darcy - aka Frank (Colin Firth, in almost permanent smolder). Things go back down when April's biological mother turns up unexpectedly, and reveals herself to be Bette Midler playing a slightly less Bette Midlery Bette Midler. But still big! Still vivacious! Still faaaa-aamous! And so forth. The movie follows April as she stumbles and hesitates and grasps through the ups and downs of her messy, complicated, not unlikable life. Her growing romance with Frank is tender, almost to the point of making us feel invasive of their intimacy (something which hasn't happened since a Raj Kapoor-Nargis film, so kudos to Colin Firth and Helen Hunt for generating such chemistry!). Her mother-daughter rapprochement with Bette Midler Starring Bette Midler always threatens with turning into madcap farce - but never does. There's an interesting meta quality, as the movie establishes and subverts a lot of the New York City rom com tropes: New York, for example, looks drab and pedestrian. This meta extends to its casting, with each member of the pretty great cast playing a character who's like a warts-and-all "real life" version of their best-known roles. Helen Hunt is the typically New Yorker New Yorker - except her Jewishness is real and tangible (she prays often), her neuroses are strange and unsightly, and she has a tendency to anxiously talk over other people. She calls to mind an edgier version of her roles in As Good As It Gets or Mad About You, if that idealized New Yorker lady actually existed and actually aged and actually had problems and insecurities. Likewise, Matthew Broderick is like an aging, Peter Pan-type Ferris Bueller. So we'd definitely recommend this film, even though the characters are sometimes annoying in their imperfections, the plot is sometimes frustrating in its refusal to adhere to standard narrative arcs, and, oh God, is the music hokey. We're actually quite a bit worried this - like the gorgeous nugget that is Cairo Time or the smart, funny, and surprising Leap of Faith - will be forgotten and disappear into the ethers in just a few years' time because it doesn't fit anyone's mold. Don't let that happen, people! This is a strong, solid, touching film with an awesome cast in very real performances. It deserves to be preserved.